An annual highlight of the programme of events of the Association is the tour of selected parts of the UK. 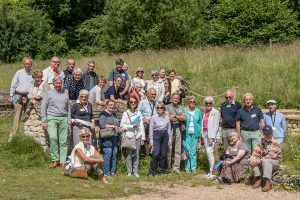 This year more than thirty members of the association under the watchful eye of Carole Ducastel toured an exciting of variety places in Gloucestershire, Worcestershire and Herefordshire. Arriving at Birmingham Airport after some slight delay the main group set off in a luxurious, but somewhat oversized coach, to the first visit of the tour at the National Trust Holy Austin Rock Houses at Kinver Edge. One does not expect to find troglodyte dwellings in the UK. So it was quite a surprise to learn that some of the rock houses were lived in until the 1950s and 60s. Having travelled independently my wife and I joined the group and the coach at the rock houses. This first visit set the scene for the tour in that it provided that essential element of a good holiday: it had variety. Variety in places such as a micro brewery, dwellings such as the rock houses, walled and formal gardens, parks, a roman villa, cathedrals, small cottages, medieval town houses, a WWII secret airfield, and impressively large country houses. The countryside through which we travelled each day as we radiated out from our hotel close to Cheltenham was also impressive. The Three Counties were gloriously set in warm, but not too hot, sunshine and were at their best being cloaked in an abundance of green foliage, outlined with the centuries old dry stone walls and dotted with stone cottages and villages pretty enough to be found on chocolate boxes. However, this was not the ideal countryside for the driver of the tallest, widest and longest coach that many of us had seen. Unfortunately, he was on mission impossible to escape the dangers of the narrow, often single lane roads, with trees and high hedges. Thus the thrills of the journeys were compounded by the addition of the many hills and torturous bends. He had our hearty congratulations and admiration for his coolness under very stressful conditions. As ever a full programme had been developed averaging three visits per day apart from the day of arrival and departure. This meant for my wife, Brenda, and I making sure we were fit enough for the many stairs of the country houses and walks around parks and gardens. The highlights for Brenda and I included Hereford Cathedral and the warm welcome we received from the guides and cathedral members, the micro brewery at Gloucester Quays which included a delightful meal, beer tasting and a very enthusiastic talk by the brewery’s young Master Brewer, and the tour at Croome Court of what is thought to be Europe’s largest walled garden covering over 7 acres by one of the enthusiastic owners. Here we found a display of imaginative stainless steel sculptures of birds and animals. One of which, the Red Kite we could not resist. Having bought the sculpture we look forward to it being delivered and seeing it in our garden. Special mention must be made of the evening at the Elizabethan Chavenage House. Viewers of the TV Series Poldark will recognise both the interior and the exterior as it features in the series plus a number of other films. The tour, guided by members of the family, who have owned the house for many years, started by having Pimms on the lawn and finished by a delightful dinner in the main dining room cooked by a member of the family. Additionally the tour by Caroline, the larger than life daughter of the current owners, was full of stories of her life growing up in what for most of us is another world. It was clear from the visit of the modest country cottage in which Edward Elgar, the English composer, was born and grew up that it had left a lasting effect on him as did his wife who greatly encouraged him. He is considered as possibly England’s greatest composer with such compositions as the Enigma Variations and The Dream of Gerontius. This year we visited Berrington Hall set in the last of “Capability” Brown’s many gardens he designed. Last year we had to miss visiting the Hall due to the necessity of changing hotels at the last moment. This year’s tour included 14 visits with a plethora of well informed guides to take the small groups into which we were formed around the properties. This facilitated the possibility to explain many small details and ask individual questions. The persons on the tour came from a mixture of countries, characters and backgrounds which represents the membership of the Association and who are bound by an interest in history, art, nature, architecture and people. The delays in the flight back from Birmingham to Brussels clearly indicated that some things can be completely outside of the control of the organisers. However the tour, which was Carole’s fourteenth, was a tribute to her enthusiasm and sheer effort she put into its planning and preparation and to whom we all owe a debt of thanks.